BeanMapper does not transform your objects. It copies all the values of the fields from an object to another object. You can configure the way BeanMapper should match the fields with annotations. However BeanMapper does have a lot more functionality than only converting Java classes. You can read about this in the rest of the documentation. What Beanmapper is not for? Beanmapper is not a library for deep-copying classes. Whenever Beanmapper can get away with a shallow copy, it will do so. Deep-copying is reserved for dissimilar classes. Take a look at BeanMapper-Spring for combining the power of BeanMapper together with Spring. Scroll down to the REST examples for usage with BeanMapper-Spring. Take a look at the BeanMapper-Petshop for samples of using BeanMapper. It shows you how to use the BeanMapper in a REST API in Java. It also show examples of using BeanMapper in combination with BeanMapper-Spring. All examples shown in this documentation are based on this example project. When building a REST API you work quite often with three kinds of objects. 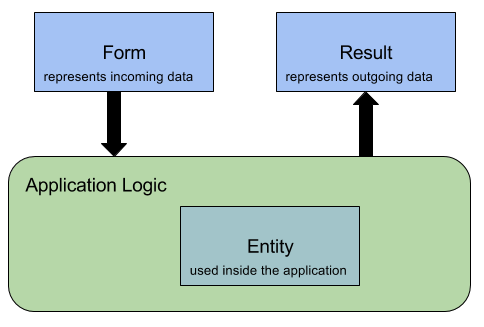 The Entity; The entity represents the data inside the application. The Result; The result represents the entity to the outside of the world. This could be a partially entity. The Form; When creating/updating a entity you often want to use a form object to pass the given data to. When using these three kinds of objects you want to convert incoming data to your entity. You also want to convert your entity to a result when representing data to the outside. These conversions will cost a lot of unnecessary code. Wouldn't it be great if mapping from Form to Entity and from Entity to Result can be done automatically? Let us suppose we have a tool that is able to map similar fields from dissimilar classes. In this case, it would be just a matter of passing both instances and delegating the task of mapping from source to target to this tool. This is why you should use BeanMapper; BeanMapper just does the above described problem in a very easy way. Want to use BeanMapper? In the next section you can read about using BeanMapper. For a more detailed use case of why using BeanMapper, read this blog The Case for BeanMapper. You can convert your objects on four different ways. Below a basic sample of each way of converting. These samples only show a basic conversion. You should take a look at the rest of the documentation if you want to map some different fields or if you want to map a different structure. Lets assume that we have two classes. SourceClass is your entity that is used inside the application. TargetClass is the class that you would like to expose to the outside. Mapping to a new class does first create an instance of the given target class. Then BeanMapper uses the map to existing instance strategy to map the source to the created class instance. Take a look at BeanConstruct if you do not have a non-args constructor. Use this method if you want to override a instance with another instance. The values of the target instance are overwritten by the given source instance. Fields are mapped base on the name of the field and based on bean conventions. BeanMapper only maps fields when a field name in the source instance matches a field name in the target instance. Use this when you explicitly do not want to map a field. Use this when you want to map fields that have no matching field names. Use this when you want to set a default value when the mapped value is null. Use this when you want to map a field of type Collection. Use this method when you want to map a collection of items to a collection of items of an other type. Of course you can do this for yourself by creating a loop and call map inside each loop. This method is just to make it easy for you. You can also pass a third optional argument to convert the list to. In this case we choose an ArrayList.class. Map only a few fields of the source class over the existing target instance. Map to a new target instance and restrict this target instance to contain only the given fields. Both methods does use javassist to create a new class. The first option is called 'downsizeSource'. This method generates a new class based on the source class but only with the fields you want to map. BeanMapper uses the generated class to map over the existing given target instance. The result is that you have mapped only a few fields from the source over the target instance. Use case for this method is for example a PATCH request. The second options is called 'downsizeTarget'. With this option you can expose a few fields of the source class to the outside. BeanMapper generates a new class based on the given target class but only with the fields you want to exist in the target. The use case for 'downsize' is to produce a class that physically contains no other fields to expose; what you see is what you get. It can be equally well transformed into for example XML or JSON, without format-specific mapping. Below examples of both options. BeanMapper has two inherent means to help you verify that beans can be mapped. One is explicit and fail-fast, the other is implicit and triggers right before mapping. Option 1 is to explicitly map the pairs with a strict side. When a BeanMapper bean is created (using the build method of the BeanMapperBuilder), it will validate all registered bean pairs. When strict sides do not have matching properties on the other side, an exception is thrown. This will disrupt the boot sequence. @BeanMapToClass / @BeanMapFromClass; annotate relevant classes with their counterparts. The annotated classes will be considered strict. The other side must provide matching properties. This option is only available if you use Spring Boot. addBeanPair; use the BeanMapperBuilder methods addBeanPairWithStrictSource and addBeanPairWithStrictTarget. This will act in exactly the same way as using the annotations and can be used if you are not using Spring Boot. Option 2 works on the convention that incoming Data Transfer Objects are called *Form and outgoing Data Transfer Objects are called *Result. Whenever a *Form in a source spot, or a *Result in a target spot does not have matching properties, an exception is thrown. The exception is not thrown until the mapping is about to take place. Feedback is slow to materialize. The process can be disabled by setting setApplyStrictMappingConvention to false. If you use Spring Boot, you only have to include is the Spring Boot starter dependency. The starter will take care of registering the right converters and bean pairs. It will offer an immediate BeanMapper for you to auto-wire. In order to use Beanmapper in your project, simple add the following Maven dependency. You can find the javadoc for BeanMapper here. You can also download the latest jar and include this in your project. With BeanMapperBuilder you can configure your own BeanMapper in the way you wanted it. For example: you can add converters, configure the way to initialize classes, configure the way to unproxy a class or already set the target instance for mapping. Use BeanProperty if the field name does not match the other field name. You can use this annotation on both sides. Use BeanIgnore when you explicitly don't want to map a field. You can use this annotation on both sides. Use BeanDefault when you want to set a default value when the mapped value is null. You can use this annotation on both sides. elementType: the target collection element type. If not passed, BeanMapper will try to determine the type by checking the generic parameter type of the target collection. You can pass your own preferred collection class, if you wish to bypass the default. flushAfterClear: if a collection gets cleared, by default the flush method will be called if globally enabled (eg, when working with Lazy). The main reason for flush after clear is to force Hibernate to first delete elements in a managed collection, before inserting new ones. By default, this setting is enabled. Use BeanCollection when you want to map a field of type Collection. If the BeanCollection annotation is not set, BeanMapper will try to determine the element type by checking the generic parameter type of the target collection. Therefore using the annotation is optional, mapping will always take place. Note that the collection instructions will be merged from both target and source side. BeanMapper prefers settings on the target side to settings on the source side. With this example we map to list using @BeanCollection with bean collection usage set to always reconstruct the target collection. With this example we map to list using @BeanCollection with bean collection usage set to reuse the target collection. With this example we map to list using @BeanCollection with bean collection usage set to clear the collection before mapping. Use BeanConstruct when you want to map a to a class without a no-args constructor. BeanConstruct uses his arguments to get the field values from the source class and pass these arguments to the target class constructor. You can use this annotation on both sides. However only BeanConstruct on the target side makes sense because that object has to be created. BeanConstructException is thrown when no valid constructor can be found. BeanInstantiationException is thrown when BeanMapper cannot intiantate the target class. Use BeanAlias when want to make a field available under a given name during the mapping process. This can be useful when using fields on a different level in BeanConstruct. This annotations can be used only at source side because you can make fields available from the source with another name for the target. BeanAlias differs from BeanProperty because BeanProperty is only available on the level where the field exist where BeanAlias is available on all mapping levels. Use BeanDefault when you want to BeanMapper to check whether the property may be copied from source to target. BeanMapper will query its attached RoleSecuredCheck instance to see if the security Principal has any one of the roles. If at least one role matches, the property will be mapped. If not, the property will be ignored. If the BeanMapper Spring Boot Starter is used, it will automatically register the SpringRoleSecuredCheck if an AuthenticationManager is found. When @BeanRoleSecured is used, but no RoleSecuredCheck has been attached, BeanMapper will throw an exception, unless enforceSecuredProperties is false. Use BeanLogicSecured if you care to have BeanMapper query the attached LogicSecuredCheck to determine if the mapping may take place. If allowed, the property will be mapped. If not, the property will be ignored. If the BeanMapper Spring Boot Starter is used, it will automatically register the LogicSecuredCheck classes if an AuthenticationManager is found. When @BeanLogicSecured is used, but its LogicSecuredCheck class cannot be found, BeanMapper will throw an exception, unless enforceSecuredProperties is false. A class implementing LogicSecuredCheck will have to be implemented, clearly stating the datatypes of the source and target classes. Tip: only specify the side you are using for the check and keep the other as Object. BeanMapper will call on the class passing both the source and the target instances. If the class extends from AbstractSpringSecuredCheck, you will have access to hasRole() and getUserDetails(). A nice feature of BeanMapper is for applying custom converters. In BeanMapper you can easily add your own converter to map fields on a custom way. You can add a converter for the current mapping or apply a converter for all mappings of BeanMapper. Below you can find both examples. You can easily extend the SimpleBeanConverter.class to convert between fields, you can extend the AbstractBeanConverter.class or implement the BeanConverter.class interface. Below a example from BeanMapper-Petshop which shows you how to apply a SimpleBeanConverter. Let's assume we have a AgeCalculator.class which extends from the SimpleBeanConverter.class. The age calculator is a beanconverter between LocalDate and Integer. Now we map a pet to a result containing the name and the age of the pet. In this mapping the birthdate, which is a LocalDate, matches the age field which is a Integer. Because we have added a converter for these types, the converter is applied and the age is calculated. BeanMapper does support by default nested objects. Nested in this context means fields that have more fields inside. For example a pet. A pet does have a name, birthDate and a type. Type is an instance of PetType which contains an id and a name. If you want to map that pet you may also want to map the type inside the pet class. BeanMapper just do that. To indicate which classes are mapped deeper inside, you have to set a package. All classes in the given package and sub-packages are eligible for mapping. The root source and target do not need to be set as such, because the verification is only run against nested classes which should be mapped implicitly as well. Below a example which is showing this use case. In this example the objects to map does not match and does have a different structure. Below a example of this case. Take a look at the next example for mapping this example in reverse direction. This use case comes up if you want to simplify your result to the outside. Your source object contains a nested structure of different fields. You want to simplify that object and create an object that represent this object in an easy way to the outside. This example shows a owner of a pet. The owner does have a name and a address. The nested address object contains several fields such as street, number and city. For simplicity you want only the name and the living place of the owner in your result. With the BeanProperty annotation you can dive into objects on the other side. In this example the annotation references address.city. BeanMapper goes to the address and gets the city from it to map it to the living place in OwnerResult.class. You can dive as deep as you want with BeanProperty. In this case you can use BeanUnwrap annotation. You want to use this annotation for example if you are mapping a form to a entity in your application. Your source object is flat and you want to convert this object to a more complex object in your application. BeanUnwrap indicates that the fields inside the annoted field should be mapped at the same level as the annotation exist. With this annotation BeanMapper can match fields on a higher level your object structure. If you want your annotations at the other side you can use BeanProperty instead of BeanUnwrap. Now you can annotate the source side. Below a example, in this case BeanProperty indicates that BeanMapper should look for a field named familyName in the object PetType. In the example below we get one pet that matches the given identifier. We convert the retrieved pet to a PetResult.class to expose the object to the outside. In the example below we send a PetForm through the request body of this POST request. The form is converted to a entity which is saved by the petService. The saved pet is converted to a PetResult.class to expose the object to the outside. This example uses a BeanMapper-Spring dependency to simplify REST requests. The request body contains a petForm.class just like the previous example. BeanMapper-Spring automatically converts the given form to a pet which can be saved. This method takes a path variable which contains the identifier of the pet to update. The updated pet is send through the request body. As you can see, the old pet is retrieved by the given identifier. Then the form is mapped over the old pet. Finally the merged pet is saved to the database and converted to a PetResult.class to expose it to the outside. This example uses a BeanMapper-Spring dependency to simplify REST requests. The previous used request body and path variable are used. BeanMapper-Spring automatically merged the given form with the old entity that is retrieved by the given identifier. The given pet as argument in this update method is the merged pet which can be saved to the database. This method is used to partially update a pet. The given path variable contains the identifier of the old pet. The request body should contains the fields and values that must be updated in the old pet. The input is converted to a form which is mapped over the old pet. The downsize source method is used to only map the given input fields. Other fields are not updated because they are not mapped over the old pet. This example uses a BeanMapper-Spring dependency to simplify REST requests. It is recommended to use this method instead of the previous example because of simplicity. The old pet is automaticly received by the given identifier "id". Then the given fields and values are mapped over this old pet and the merged pet is given as argument in this partialUpdate method. After this you can do anything else with this merged pet and finally save it to the database. Usage of BeanMapper is not needed for deleting objects by a given identifier. value; the class type of the input form. patch; when patch, we only map the provided properties from our input form to the entity (default false). mergeId; entity identifier variable in your path mapping. multipart; if the request is a multipart form this identifies the part to read the content from. mergePairClass; name the entity that the form must be mapped to. In order to use this, the parameter class in the controller method must be of type MergePair. The instance will contain both the original instance and the merged instance. Use MergedForm if you want to map an input form automaticaly to a entity. MergedForm is capable of reading an input form and mapping this into an existing/new entity. The entity is declared as parameter in our handler mapping method. Take a look at the create, update and partial update methods of this documentation to see different usages. Below a example of a partial update method. The MergedForm annotation converts the input form to a entity which can be saved. You can find the javadoc for BeanMapper spring here. Then the following argument resolver should be added. Finally you can create a BeanMapper. The package prefix is necessary for mapping nested entities. All classes that exist in the package of ApplicationConfig.class are mapped recursively. A different bean unproxy method is added for removing proxy of spring classes. The id to entity converter is added for conversion from a identifier to a entity (read more). The previous section shows that you should add a IdToEntityBeanConverter for using beanmapper spring. This converter is applied when mapping a identifier to a entity. It uses spring repositories to get the identifier matching the entity. Since mapping to an Entity is done at an early stage, your Spring MVC controller level tests must be configured to deal with the usage of repositories. The MockMvcBeanMapper is configured at the level of your abstract controller test, ie the class your controller tests all extend from. Each of these vectors need to be addressed to set up controller tests that can deal with repositories. In your controller test, you will have to register all the repositories (presumably mock classes) that need to be added, ostensibly in a @Before method.